Associations between thunderstorm activity and asthma morbidity have been reported in numerous locations around the world.1 The most prominent hypotheses explaining the associations are that pollen grains rupture by osmotic shock in rainwater, releasing allergens, and that gusty winds from thunderstorm downdrafts spread particles and/or aeroallergens, which may ultimately increase the risk of asthma attacks. A full understanding of “thunderstorm asthma” is crucial, especially with projections of increases in heavy rainfall, thunderstorm events and aeroallergen concentrations as the climate system warms.2 3 Many existing studies of this phenomenon have been limited in power and scope.1 Our study seeks to conduct the most extensive investigation of thunderstorm occurrence and asthma morbidity to date in a region, the Southeast US, that has not previously been examined but where thunderstorms are highly prevalent. We capitalised on the availability of an extensive emergency department (ED) visit database, consisting of data on over 10 million ED visits collected from 41 of 42 hospitals in 20 county Atlanta, Georgia, between 1993 and 2004. We selected visits for asthma (identified using the primary International Classification of Disease, 9th revision diagnosis codes 493, 786.07) by patients residing in zip codes located wholly or partially in the study area. Thunderstorm occurrence data were obtained from the automated surface observing system station at the Atlanta Hartsfield–Jackson airport, which recorded 564 thunderstorm days (12.9% of 4383 total study days). In order to test the mechanistic hypotheses of thunderstorm asthma, we also obtained total daily rainfall and maximum 5 s wind gust data. The wind gust data were used as a surrogate for thunderstorm downdrafts and to indicate the maximum wind speed of the storm. We assessed the association between thunderstorms and next day asthma ED visits using Poisson generalised linear models.4 We controlled for long term temporal and seasonal trends and meteorological conditions with cubic splines,5 which allow for flexible control of temporally varying confounding factors. We examined effect modification by levels of rainfall and wind speed, defined a priori by quartiles of their respective distributions. We observed 215 832 asthma ED visits during the study period; 24 350 of these visits occurred on days following thunderstorms. In our epidemiological models, we observed an association between daily counts of asthma ED visits and thunderstorm occurrence (p<0.001, fig 1). Overall, asthma visits were 3% higher on days following thunderstorms. 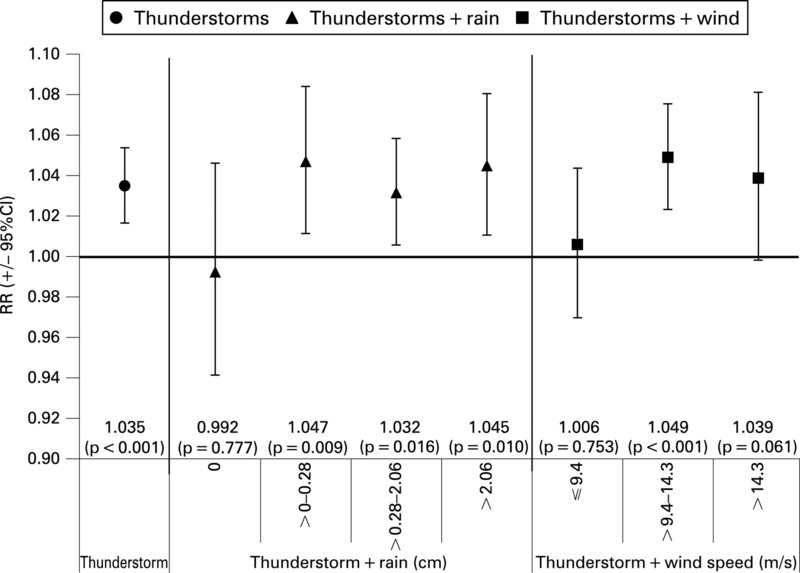 When thunderstorms were stratified by rainfall amount, associations with asthma were observed for thunderstorms with rainfall but not for thunderstorms with no recorded rainfall. When thunderstorms were stratified by wind gust levels, associations with asthma were strongest when wind gusts were intermediate and high. Figure 1 Relative risk of asthma emergency department visits following days with thunderstorms, thunderstorms in combination with rainfall (in four categories) and thunderstorms in combination with wind speed from maximum 5 s wind gusts (in three categories), compared with days with no thunderstorms. Relative risks (RR) and p values are presented for each model result. Our findings corroborate previous reports of an association of thunderstorm activity with asthma exacerbation. Furthermore, our results provide preliminary evidence in support of rainfall and wind gusts playing important roles in this association. While a 3% increase in risk may seem modest, asthma is quite prevalent in Atlanta and a modest relative increase could have a significant public health impact in the population. This analysis used meteorological data from one weather station. However, thunderstorms are small scale phenomena, and these data may only represent events in close proximity to the station. Planned analyses will take advantage of data from other local stations, radar data on thunderstorm characteristics and spatial resolution of the outcome data to conduct a more refined assessment of the mechanistic basis of the observed association.
. Thunderstorm-asthma and pollen allergy. Allergy 2007;62:11–16. Intergovernmental Panel on Climate Change 2007. Summary for policymakers. In: Solomon S, Qin D, Manning M, et al., eds. Climate Change 2007: The Physical Science Basis. Contribution of Working Group I to the Fourth Assessment Report of the Intergovernmental Panel on Climate Change. Cambridge: Cambridge University Press.
. Climate change, aerobiology, and public health in the Northeast United States. Mitig Adapt Strat Glob Change 2007 (doi 10.1007/S11027-007-91341).
. Poisson regression analysis. In: Applied regression analysis and other multivariable methods, 4th Edn. Belmont, CA: Duxbury, 2008:661–92.
. Ambient air pollution and respiratory emergency department visits. Epidemiology 2005;16:164–74. Funding: This work was supported by grant No R01ES11294 from the National Institute of Environmental Health Sciences, STAR Research Assistance Agreement No R82921301-0 from the US Environmental Protection Agency and grant No EP-P4353/C2124 from the Electric Power Research Institute. Although the research described in this article has been funded in part by the NIEHS and USEPA, it has not been subjected to peer and policy review by these agencies and therefore does not necessarily reflect the views of the agencies.